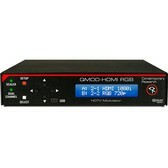 The Contemporary Research QMOD-SDI HDMI can accept both SDI and HDMI sources giving you the most commonly used connections in 1 unit. The modulator can accept both standard SDI resolutions and now can accept 3G SDI and 60/30 Hz feeds from prosumer SDI sources. The LCD menu makes navigation, control, and set up simple. Connect via 1 HD-SDI or 1 HDMI and audio consisting of stereo, optical, and coax audio. In addition to standard SDI resolutions, the QMOD-SDI HDMI can accept 3G SDI and 60/30 Hz feeds from prosumer SDI sources. 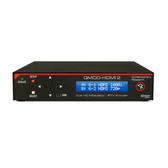 The QMOD-SDI HDMI distributes channel over an on-site broadband cable system with adjustable output level to 29 dBmV, compatible with all cable format broadband systems. 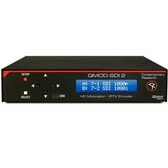 The QMOD-SDI HDMI includes dual channels, one over HD-SDI and the other over HDMI. 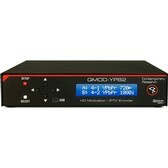 The QMOD-SDI HDMI has dual encoders to process two MPEG video streams, each supported by a hardware scaler that can accept and format virtually all video between 1080p and 480i in NTSC, VGA, and PAL standards. Audio can be embedded, or fed separately to digital SPIDF or analog stereo inputs. Two NTSC inputs support composite video or video with closed captioning data. Embedded captioning from Line 21 data on composite video inputs and SDI.